'Albert Pinto Ko Gussa Kyon Aata Hai neither asks nor answers,' complains Sukanya Verma. 'There are probably more people who have heard the title than have actually seen the film,' Naseeruddin Shah writes in his memoir, And Then One Day. Indeed, people are more familiar with Albert Pinto Ko Gussa Kyoon Aata Hai and its increased pop culture value since Jaane Bhi Do Yaaron than the slowly building angst of his titular hero in Saeed Mirza's art-house classic. Director Soumitra Ranade doesn't fall in this category. Mirza's life-like pace and conversations revolving around Christian minorities against the backdrop of Mumbai's textile mills spoke of political awareness and urban exploitation. Unfortunately, Ranade's affection for the movie doesn't translate into a compelling remake. It is hardly even a remake and bears little resemblance to the tone, texture or ideals of the original. While Albert Pinto Ko Gussa Kyoon Aata Hai inflamed the sparks of rebellion, the new one spelling -- Kyoon as Kyon -- treads a reckless path to justify dubious outrage. Ranade's depiction of Albert Pinto's temperamental existential crisis across zigzag flashbacks creates an infuriatingly disjointed picture of the man and his mind. Between Albert Pinto, played by (Manav Kaul), hitting the road with Saurabh Shukla in pursuit of scamsters, his family members discussing his sudden disappearance to a cop and haphazardly introduced flashbacks, the script is an incoherent mess. The new-age Pinto's arguments aren't out of line. He doesn't see the point in procreation in an increasingly corrupt, consumerist world. He is put off by public apathy and storms in sarcasm. Except what should seem like the ire of an exasperated common man appear as hysterical ramblings of an unhinged human. Albert Pinto labours hard to be metaphoric and of significance. The road trip as well as the people and problems he encounters are something like a journey into his stream of consciousness. But its tendency to veer off into bizarre spaces like paedophilia and then move ahead without concern rankle no end. Dangling between profound and profane, Albert Pinto's focus is neither intimate nor idiosyncratic to pull off the bizarre flights of imagination in which the sore titular hero sees his girlfriend in every other woman. Also, those who haven't watched Mirza's 1980 creation will miss the context of Ranade's allusions to characters only named here. Despite the serious faults in Albert Pinto Ko Gussa Kyon Aata Hai's manufactured despair, the cast saves it from becoming a work of complete pretentiousness. 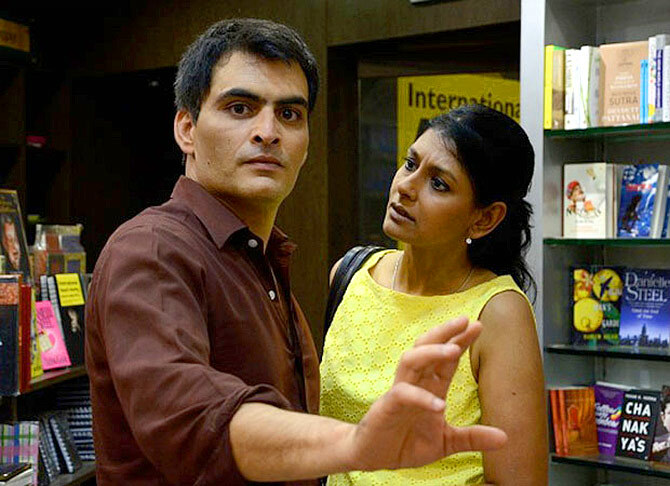 Manav Kaul's intensity shines and engages even when the subtext to his outburst is poorly established. He could be Albert, Akbar or Amar, ethnicity is hardly of any consequence. Nandita Das may be a bit too clever for the part, but her easy-going presence makes the inadequacy slightly easier to endure. But it is brilliant Saurabh Shukla's comfort in portraying sickening depravity that stands out in a movie that doesn't know where to go. Backdrops change, problems change but Albert Pintos continue to spawn in the unending cycle of subjugation and subversion. Ranade fails to develop it beyond a thought. Albert Pinto Ko Gussa Kyon Aata Hai neither asks nor answers.